Oh Sesame Street – we had some good times. It’s been far too long since I’ve seen that show. Probably because there are no wee ones in my life (and I am totally okay with that). 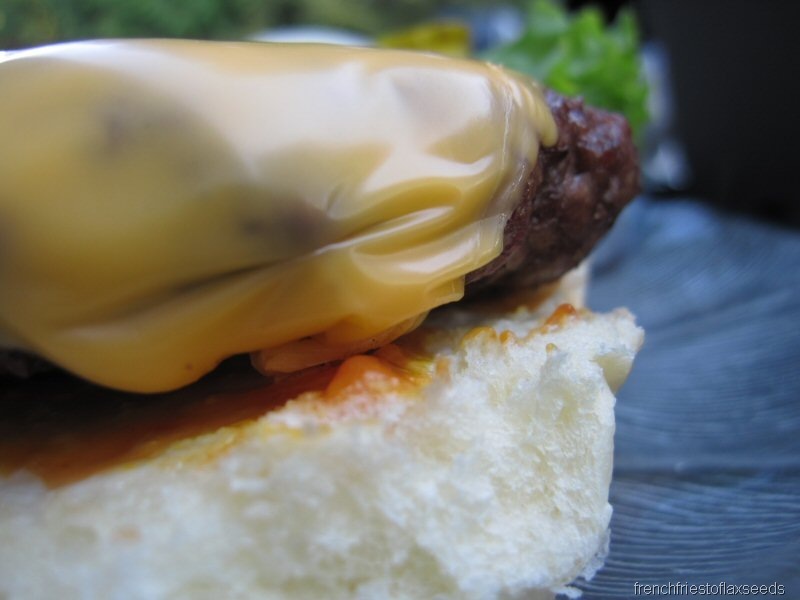 Yes, my burger was topped in plastic processed cheese. That’s how we roll here apparently. I also added some mustard/ketchup/mayo to the fluffy white bun, and some lettuce, onions, and pickles so I could pretend it was healthy. Oh plastic cheese. How can you pass that up, with photos like the above, accentuating the plastic-ness of it. Seriously. 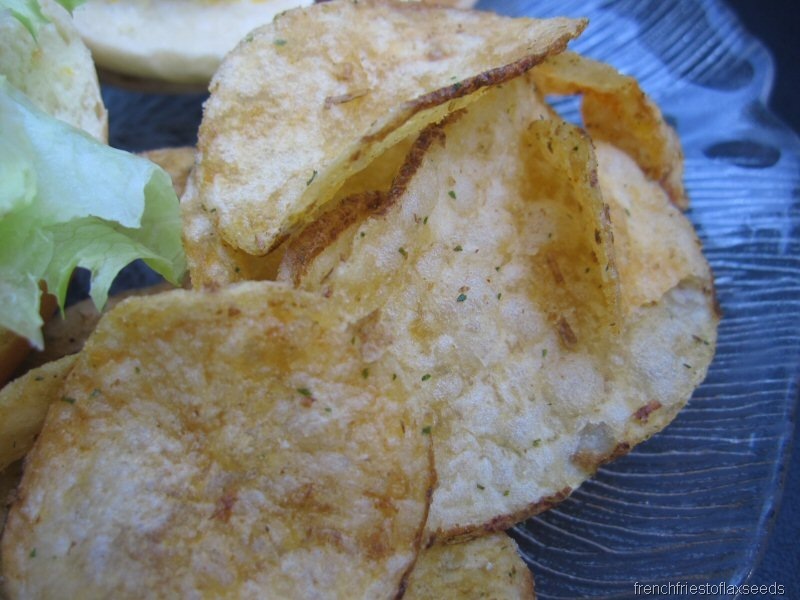 On the side there was a handful of Jalapeno Kettle Chips. I jalapeno chips. They are totally one of my top flavours. And don’t hurt my tummy like regular old jalapenos can. I hit up the gym later on with my sister, since we skipped out on kickboxing earlier. I spent some time on the stair climber, then doing some upper body weights. I know I got in a good upper body workout, because my arms were actually shaking as I was driving home. Perhaps not the safest, but girl’s gonna get some rockin’ pipes! I can dream, can’t I? 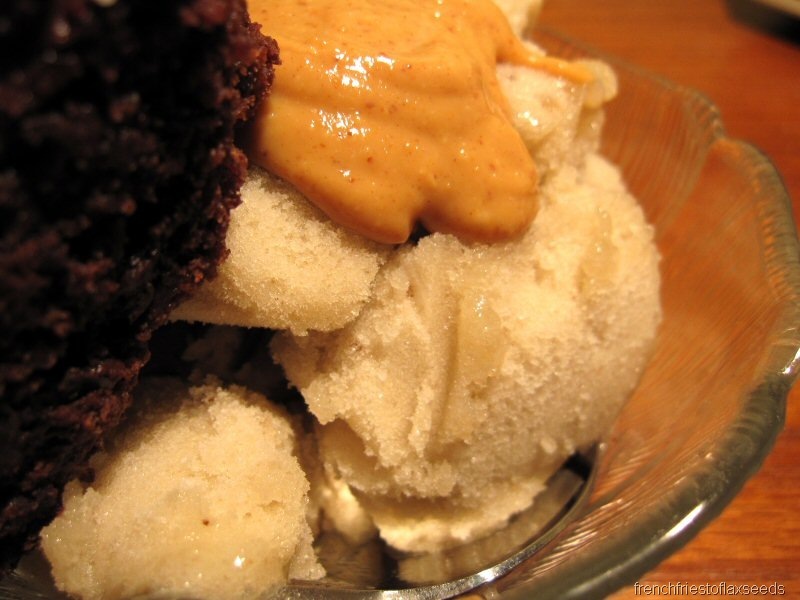 What makes peanut butter & banana even better? 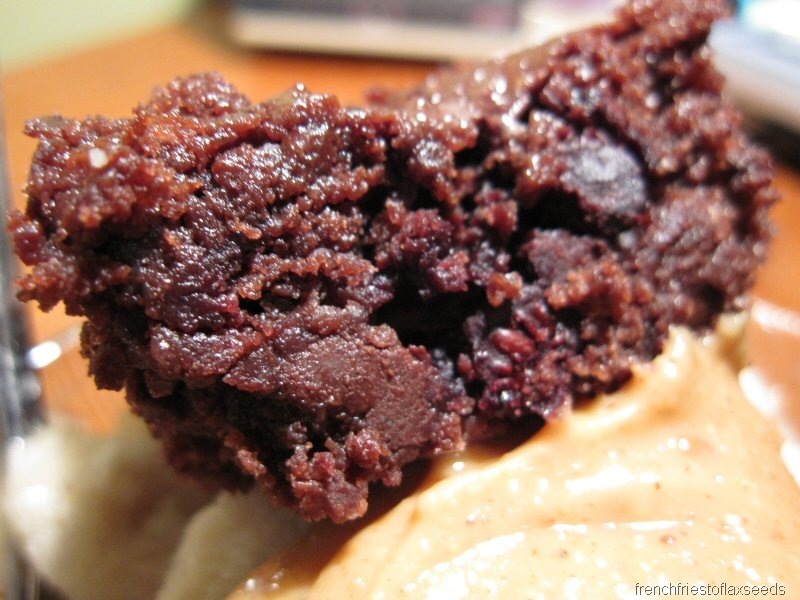 Chocolate of course – in the form of a Fudgy Wudgy Blueberry Brownie. It was one beautiful bowl of dessert. Insert some time wasting activities like TV, Wii, and interwebbing, and that about wraps up my day. Oh, and I finally got a respectable picture for my student ID! Yay. I’m hoping it will be ready to pick up on the first day of school, which is quickly approaching. Ack! Time for this girl to get to bed. Night! Somehow I got quite behind! Congratulations of figuring out the internet problem. Phew! I laughed at the plastic cheese! You’re right, that’s exactly what it looks like! I’m guilty of eating it though. I don’t care what the haters say: white bread and processed cheese hits the spot sometimes! Oh Sesame Street, I miss it! We used to guess what the secret letter or number was before the show ended (because they would say it at the end of the show). So fun. The burger looks amazing (even with the plastic cheese!). And those kettle chips, yeah, Nick and I are HUGE fans! 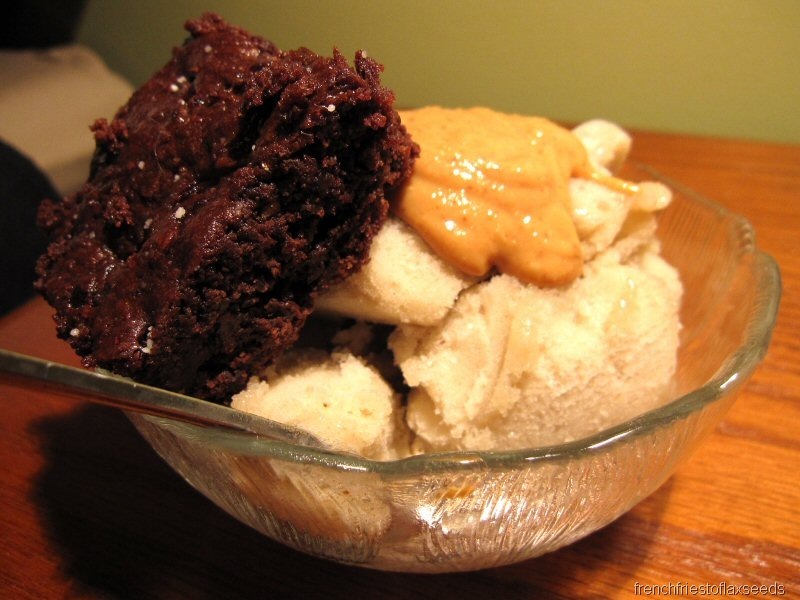 I love brownie, soft serve (any flavor), and pb, perfect combo! I haven’t seen Sesame Street in ages and I have kids! It was one of my fave’s as a kid, though! Whatever! 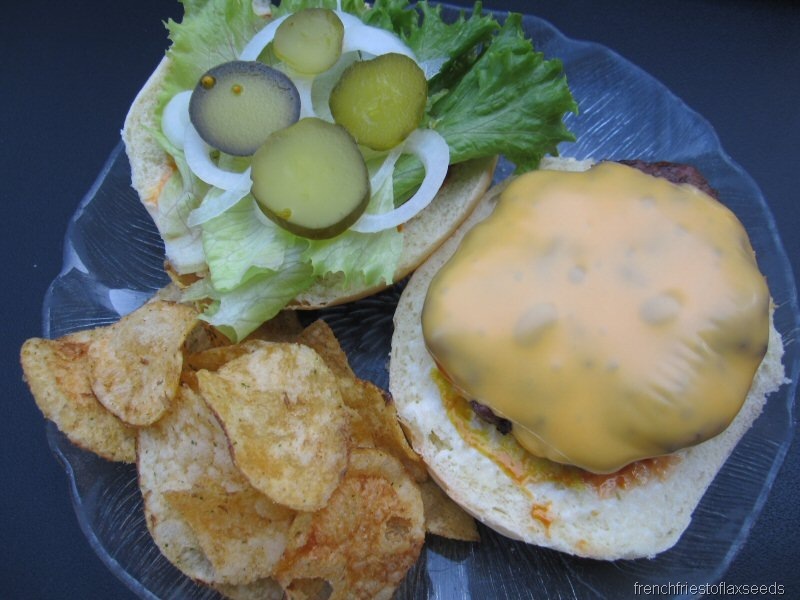 Life is too short to not have your occasional processed cheese, white bun and hamburger. Your letter ‘B’ dinner was awesome. However, I would have had 3x that amount in potato chips 😉 !